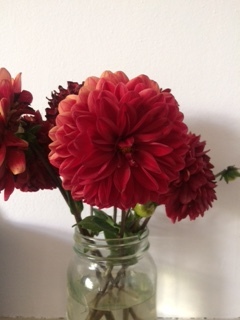 In the spring I started my dahlias in the greenhouse and then planted them half and half at the allotment and on my veranda, wondering which would win the race to flowering: breezy and exposed with full sun at the plot or sheltered and protected but with a little bit of shade back home. I can now announce that the allotment dahlias have won by a mile, and I am even now, in early July, on my second bunch. The plot is at the top of a hill and everything gets battered about by the wind up there, particularly in my ‘flower spot’ at the very front of the plot (I try to put flowers there every year to make passersby go ‘ooh’) and in a more typical and unsettled summer those with the extra shelter might have been happier. But no, this incredible run of warmth and heat means the allotment team has had a straight run of it, no late chills to stop them in their tracks, no getting knocked over by a summer gale. And so they are blooming good and early in the year while the veranda ones sit about looking green. I’m still glad I planted some by the house though. Vases of flowers are very nice indeed but I will enjoy them all the more when they arrive and are wafting about outside my backdoor. This one is ‘Queen of the Night’, a gorgeous deep red that has outer petals that fade to a soft and very complementary peachy orange. New to me and very lovely. The beauty with starting both lots in the greenhouse was that they were in robust health before they were planted out. This is most important in outrunning the slugs in those first few crucial weeks after planting, as when the plants are little they can munch them down to the ground repeatedly until they run out of energy and give up. I’m not sure that slugs have been much of an issue since though, perhaps they are not enjoying crawling across the parched earth. There are other flowers to follow at the plot, in particular the pretty little species-like gladioli (such as Gladiolus communis subsp. byzantinus and its friends) that I have been planting at intervals through the summer, a handful every couple of weeks. They are very biddable plants that don’t have a strong design on exactly when they would like to flower, as some do. They will flower a set amount of time after you plant them, so by staggering planting you stagger flowering, which is handy if you don’t just want one big bucket of gladioli some time in late July. Unlike the dahlias they are struggling in the heat, looking particularly parched, but hopefully I will get some flowers anyway. Also still to come are the sunflowers, started in little modules in the greenhouse in spring. They are loving the sun, as you would expect, and are growing big and handsome. I am hoping for a couple of sky scrapers. Next year’s plan for the flower patch has to involve more dahlias – they do so well up there rain or shine. I was stopped in my tracks by a dahlia a little further down the allotment path in a gorgeous shade of peach. As I snapped a picture its owner came over to say hello but couldn’t tell me which one it was, however I have since identified it as ‘Linda’s Baby’, and will be adding it to the list for next year. A plot full of dahlias can never be a bad thing.